Newdelhi:5/11/18:The Ministry of Tourism signed a Memorandum of Understanding with the Ministry of Culture, Sports and Tourism, Government for the Republic of Korea for strengthening cooperation in the field of Tourism in New Delhi today. Shri. 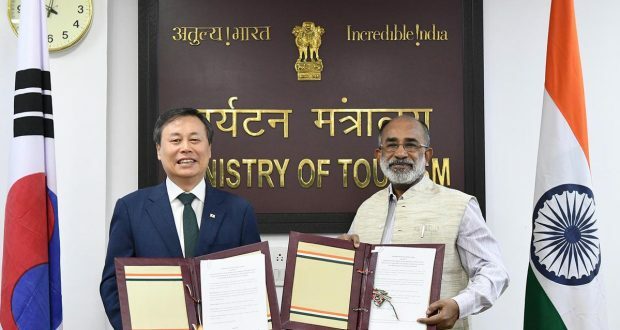 K J Alphons, Union Tourism Minister and Mr. Do Jong-hwan Korean, Minister for Culture, Tourism and Sports, Republic of Korea signed the MoU and officials from the Ministry and their counterparts from the Korean side were also present during the signing ceremony. The MoU was signed by two parties desiring to strengthen and further develop the established relationship for strengthening cooperation in the field of Tourism. The Republic of Korea is one of the leading tourists generating market for India from East Asia. Foreign Tourist Arrivals (FTAs) from the Republic of Korea in 2017 were 1, 42, 383 and during January- September were 1, 08,901(provisional figure). The signing of Memorandum of Understanding with Korea will be instrumental in increasing tourist arrivals from this source market.